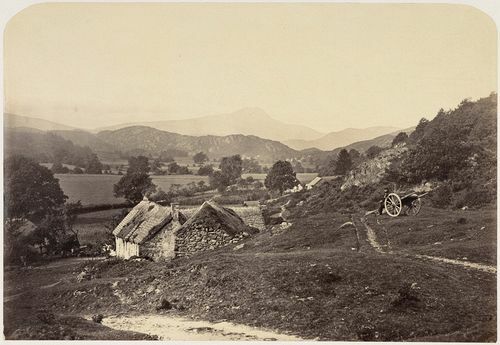 This photograph shows a rather nostalgic view westwards from the village of Aberfoyle, on the dividing line between the Highlands and Lowlands. To the right of Ben Lomond are the lands of Craigrostan, which once belonged to Rob Roy. A famous character in Scottish history, Rob Roy MacGregor was a cattle trader who, as a result of business failure and switching political sympathies, lost his lands and became an outlaw and rebel. His reputation as a folk hero took on mythical proportions after the publication of Sir Walter Scott’s romanticised version of his life in 1817, and this photograph would certainly have been interpreted in that context. Before Scott’s visits to the area, Aberfoyle was small and insignificant, but the success of his novels led to a sudden increase in visitors.